Strandhaus mit 4 Schlafzimmer, 3 Badezimmer und 1 WC. Wohnzimmer mit TV 40 'LED, Terrasse von 50 m mit Chillout-Bereich, voll ausgestattete Küche mit Spülmaschine. FLOOR Penthouse mit 2 sonnigen Terrassen. AREA Waschen und Bügeln. Klimaanlage in jedem Zimmer und Essen. Heizung, Wireless LAN, optional Reinigungsservice. Private Garage für ein Auto. CLEANING SERVICE Gärtner und POOL mehrmals pro Woche. GREEN ZONE an der Tür Haus mit Park. 3 Badezimmer (eins mit Badewanne und zwei mit Dusche) und eine Toilette. the corner. You will not be disappointed with the house, it has 4 bedrooms, one on the top floor that benefits from 2 terraces. There is also a laundry room which was useful. Everything was as described, including wi fi and a play station. The owners met us at the property to show us round and were very helpful. We would love to return to the house when we visit Javea again. La casa es exactamente como aparece en las fotos. Grande, muy grande y totalmente acondicionada. Tenía de todo lo que te pueda hacer falta en tus vacaciones. Somos un matrimonio con dos hijos mayores y estuvimos de maravilla. Diana, la propietaria, es muy agradable y cumplió exactamente con todo lo que habíamos hablado. Sin duda, la recomendamos. 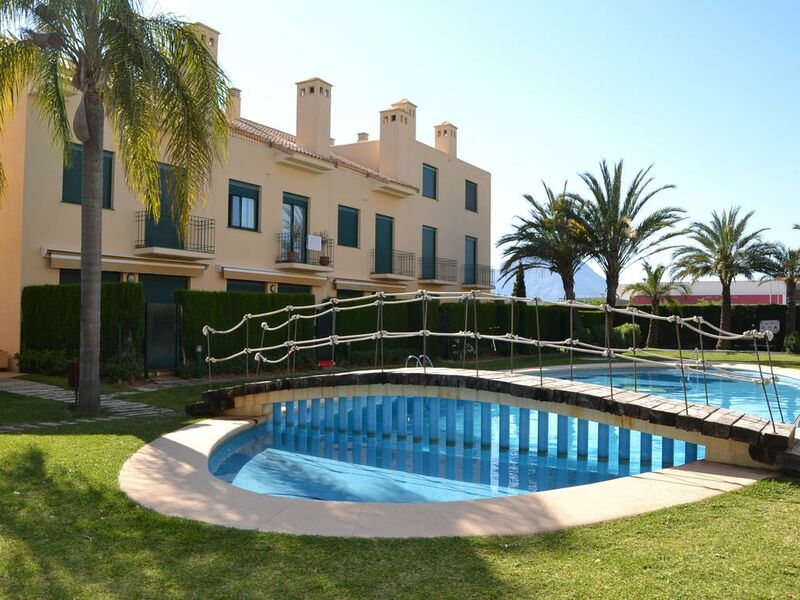 The apartment was ideal for what we wanted, it was close to the beach within 10 mins walk, had a nice pool area and was well equipped and clean and tidy. Diana was most helpful and was available if we needed anything which we didn't as everything was available at the apartment. Overall we had a very relaxing week and would be very much interested in returning to the apartment. A great holiday house for our Easter vacations. The house was exactly as it was described. Very comfortable and clean, we had every comfort we needed, including heating, tv and wifi The location is ideal, adjacent to a park perfect for jogging, in a quiet area, very close to the beach and all the amenities. Every bedroom was big and comfortable with built-in wardrobes, the kitchen had everything we needed and the living area pleasantly furnished. I personally truly appreciated the laundry on the top floor: again it had everything I needed and was very well organised. We felt at home also thanks to Diane who was very kind and available. I definitely recommend it!! Lo tiene todo. La descripción de la casa es tal y como lo explican en la web. La casa está muy cuidada y con gusto, muy cerca de todo, a una distancia agradable de la playa y el paseo marítimo , pero a la vez muy tranquila y sin ruidos. Los dueños, Diana y Carlos, atentos a lo que necesitábamos . Perfect beach holiday home for families! We as a family of five (being a German and Dutch couple with 3 young children between 5 and 10 yrs old) had a great time in Javea and in Diana’s house which felt immediately as a home! The house has everything you need and is perfectly located in the area. There is a supermarket in walking distance (around the corner) you can easily walk to the Arenal beach (also easy to do with smaller children) where there are many nice restaurants and bars. You do not need to use the car at all for this. The surrounding areas also have a lot to offer for families and Diana gave us many nice ideas for days out with the kids. She helped us always immediately with all our questions. The house is spacious with 4 bathrooms and has a nice outside area for eating and chilling. Behind the house (with direct access from the garden) is a very nice park area with playground to play football or games. The house is in a very safe area. The outside pool area is perfect for the children to play and enjoy all over summer. The bedrooms are good sizes and the kitchen has all you need. The washing machine is brand new. Everything in the house is clean, seems to be very new and the internet connection is very fast. Diana, Thank you for all your help and for the inside information about the area! We had a fabulous time in Javea and we felt immediately at home in your house. Also for the kids it was easy to feel at home and play around the pool and on the beach! We will definitely return and enjoy more holiday here in your house. Liebe grüsse, hartelijke groeten, many greetings, Knut, Sonja, Lars, Julia and Sven! Thank you Knut, Sonja, Lars, Julia & Sven! Its a pleasure and I'm so happy that you felt like at home. In der Mitte der Sandstrand, Bars, Restaurants und Freizeiteinrichtungen von höchster Qualität. Besuchen Sie die Altstadt und den Hafen. Genießen Sie eine Bootsfahrt oder einen Tag der Fischerei. Besuchen Creek Granadella zum besten Strand in Spanien im Jahr 2012, oder besuchen Sie die Bucht Barraca. Ausflüge nach Cabo de la Nao und Cabo de San Antonio. Benidorm, Valencia mit der Stadt der Künste und Wissenschaften oder Alicante.